New. Science Fiction, Literature & Fiction. 1st edition 1st printing paperback, new In stock shipped from our UK warehouse. Fair. Well-loved Book. May have markings, water damage, missing jacket/CDs/supplemental materials, and heavy wear. Stock photo may be different from actual cover. Very good. This book is clean of marking and has very light signs of use. May have inscription. Stock photo may be different from actual cover. This book finishes the trilogy begun in Mistborn and continued in Well of Ascension. 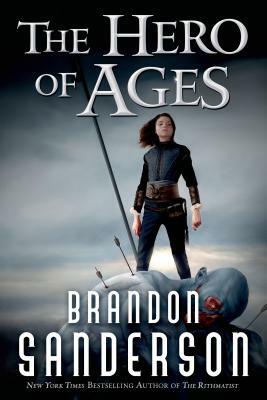 The breakup of the Final Empire, which began in Mistborn with the death of the supposedly immortal Lord Ruler, and continuing in the Well of Ascension, with the release of the spirit of Ruin, finds an exceptionally well written and well thought out conclusion in Hero of Ages. The brilliance of the novel lies not so much in the plot, though I do not recall any book covering the end of the world so thoroughly, but in the characters ability to fight the good fight, even though they are obviously losing. The faith and strength of will to continue striving as odds mount against them and all seems lost is believeable and inspiring. The ending one of the most satisfying I have ever read. It made the series complete and whole in a way I haven't seen in many trilogies. To anyone who has ever enjoyed any fantasy, you need to read this book. But you will need to read the other two first. It is definitely not a stand alone book.